Green Bean Casserole with Bacon is everyone’s favorite classic holiday side dish kicked up with tons of mouthwatering flavor. 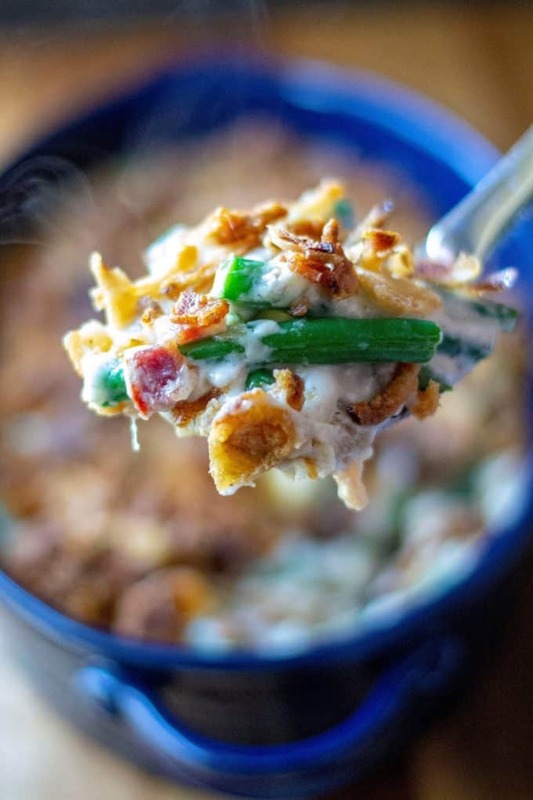 Made with fresh green beans, crispy bacon, topped with French fried onions and melted cheese and no condensed soup, this Green Bean Casserole with Bacon is the perfect easy side dish any night of the week. There are just some dishes that are part of your family. I don’t mean these particular foods are your familys favorite meals… I mean, these foods are part of your FAMILY. These are classic meals or desserts or side dishes that make their appearance at every holiday dinner year after year so much so that you look forward to your favorite holiday food more than you do seeing your Uncle Bob. Easter? Baked ham … Christmas? … well, more baked ham but also maybe Homemade Pierogies. Thanksgiving has to be… pfft … more baked ham but now we throw in some Scalloped Potatoes and we have a party waiting to happen. And what classic holiday side dish is present for each and every major holiday? Yup.. you guessed it… the star of the show when it comes to must have vegetable side dishes.. green bean casserole. Now, I don’t know about you but growing up in my family, green bean casserole consisted of canned green beans and a can of some flavor of condensed soup all baked up and topped off with those crispy little French fried onion rings. That easy peasy recipe for green bean casserole is such a classic holiday dish that the recipe should be tattooed on every homemaker across the United States. And why not? Classic green bean casserole is as much an American holiday REQUIREMENT as serving up turkey at Thanksgiving. That being said, would it be so bad to tweak our favorite veggie side dish and make a couple of much needed improvements? And why are we only eating green bean casserole at the holidays? That baking pan of green deliciousness is legit for any day of the year so stop saving it for just the holidays!! Be wild, get crazy .. serve that GBC up on a random Wednesday night with some chicken and a batch of buttermilk biscuits. Your family will love you for it. GREEN BEAN CASSEROLE WITH NO SOUP? Let’s take a minute to talk about condensed soup. I am a fan.. I admit .. when it comes to needing a creamy glue to bring a beloved casserole together in a blink of an eye, condensed soup is the way to go. However, it’s also often times full of a ton of sodium and I think for holiday side dishes, wouldn’t it be fun to surprise everyone with your swanky cooking savy and non-condensed soup way of life? The answer to that is Yes, yes it would. 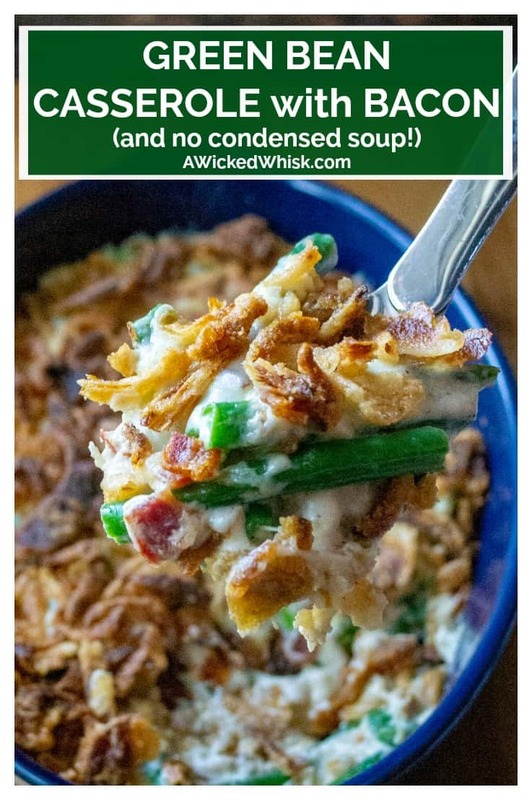 All joking aside, this Green Bean Casserole with Bacon is super easy to make and you will love serving up a green bean casserole with no condensed soup. Remember … swanky! DO YOU NEED TO USE FRESH GREEN BEANS? 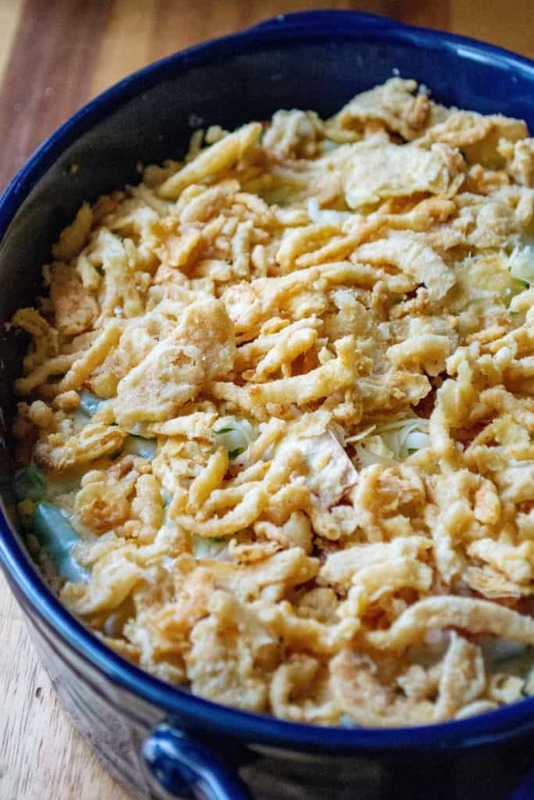 Green bean casserole can certainly be made with canned green beans if you are unable to find fresh green beans of if you simply prefer the canned or frozed green beans. 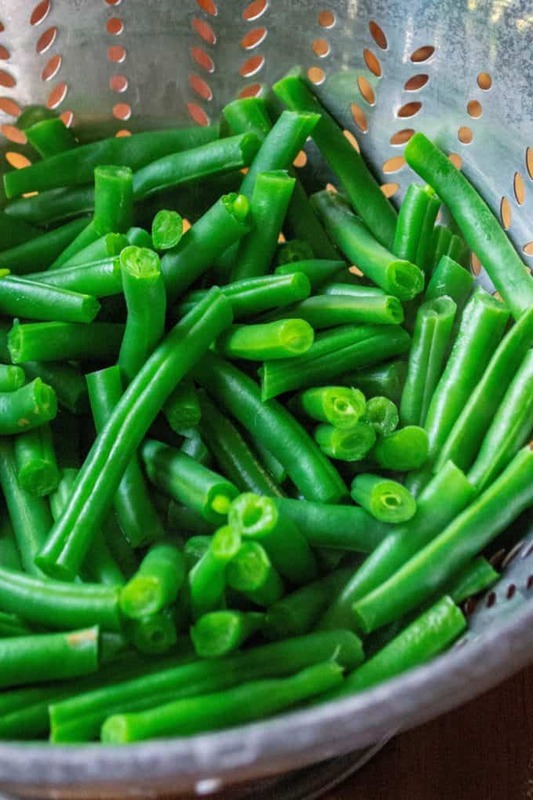 Simply substitute three 14 ounce cans of green beans for the fresh green beans called for in the recipe and skip the step where you blanche them. Simply drain the water from the cans and use your green beans as directed. 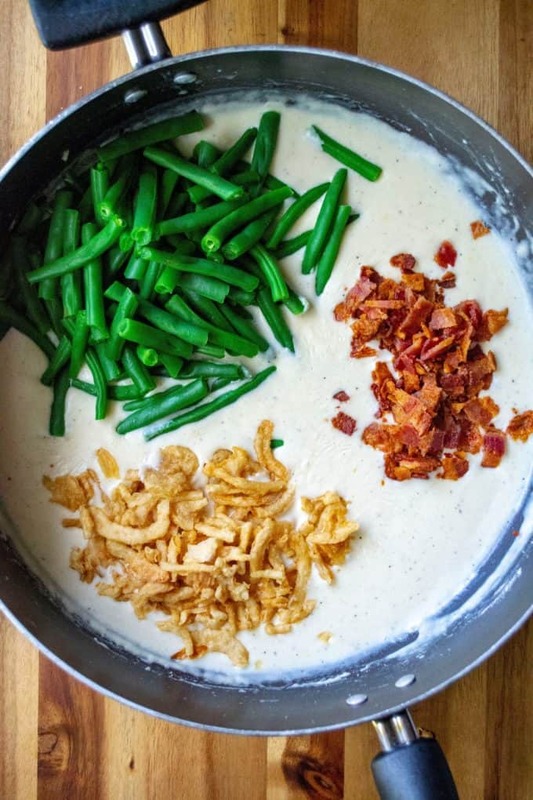 CAN GREEN BEAN CASSEROLE WITH BACON BE MADE AHEAD OF TIME? 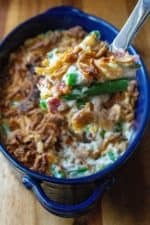 This Green Bean Casserole with Bacon is a great make ahead dish.. simply assemble the Green Bean Casserole and let cool completely. Cover dish tightly and refrigerate. The next day, bake for an extra 5-10 minutes and enjoy! If you don’t wish to add the bacon, feel free not to. 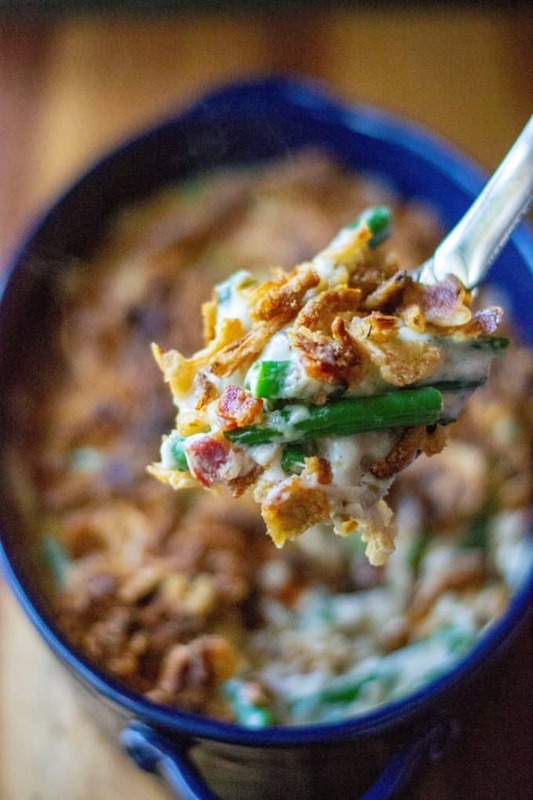 This green bean casserole recipe is delicious with or without the addition of bacon. 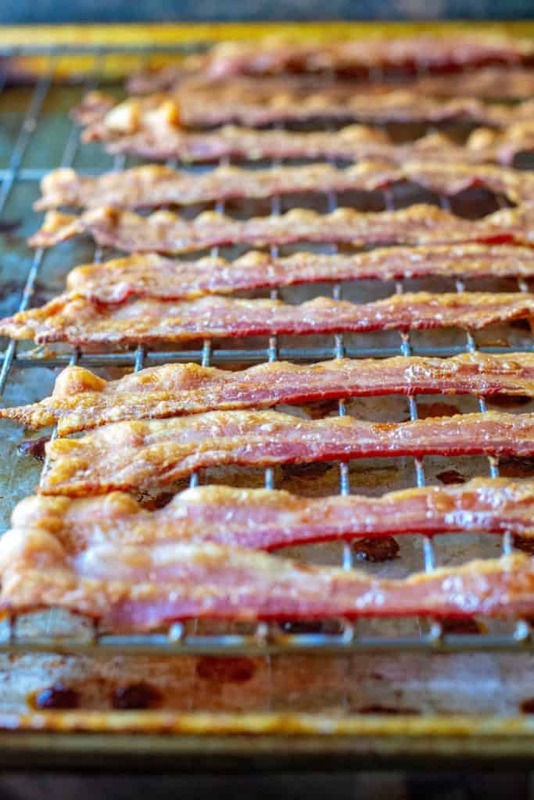 This recipe calls for 6 slices of crispy cooked bacon. If you are running short on time or just want to free up your oven or stove top, consider using one of the pouches of pre-cooked bacon pieces usually found in the salad dressing aisle of your grocery store. They are super convenient and taste great without the mess and extra work of cooking up bacon. Monterey Jack cheese is super mild so if you are looking for a bit more punch, get creative with your cheese choices. Swiss, cheddar, havarti are all amazing substitutions. 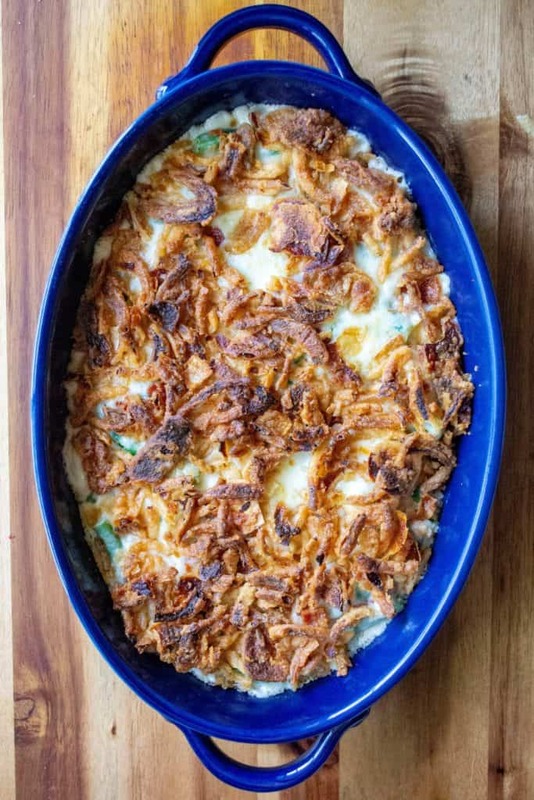 HOW DO YOU MAKE GREEN BEAN CASSEROLE WITH BACON? Easy! To make Green Bean Casserole with Bacon, preheat your oven to 400 degrees. Cover a baking tray with parchment paper or add a metal cooling rack to it and lay your bacon out side by side to cook. Bake for 15 – 20 minutes or until crisp. Remove bacon from the oven and when cool enough to handle, chop into bite sized pieces and set aside. While your bacon is cooking, bring a large pot of salted water to boil. Add the beans and blanche for 4 minutes. Remove from the water and set aside. Heat a large skillet over medium high heat and add the butter. Once melted, add the garlic and saute for 1 minute, stirring often so that the garlic does not burn. Add the flour and whisk together, cooking for 1 minute. Add the chicken stock and half and half, whisking to combine then add in your spices. Continue whisking until it comes to a low boil and and then stir in the parmesan cheese. Remove from the heat and add in 1/3 of the fried onions, bacon pieces and green beans. Stir to combine and transfer to a buttered baking dish. Top green beans with monterey jack cheese and the remaining fried onion crisps. Bake for 10-15 minutes, remove from the oven and serve while hot. This Green Bean Casserole with Bacon is super delicious and a great new twist on your classic holiday side dish. Looking for more amazing side dishes to try? Check out a few of my favorites below..
Green Bean Casserole with Bacon is everyone's favorite classic holiday side dish kicked up with tons of mouthwatering flavor. Made with fresh green beans, crispy bacon, topped with French fried onions and melted cheese and no condensed soup, this Green Bean Casserole with Bacon is the perfect easy side dish any night of the week. To make Green Bean Casserole with Bacon, preheat your oven to 400 degrees. Cover a baking tray with parchment paper or add a metal cooling rack to it and lay your bacon out side by side to cook. Bake for 15 - 20 minutes or until crisp. Remove bacon from the oven and when cool enough to handle, chop into bite sized pieces and set aside. While your bacon is cooking, bring a large pot of salted water to boil. Add the beans and blanche for 4 minutes. Remove from the water and set aside. Heat a large skillet over medium high heat and add the butter. Once melted, add the garlic and saute for 1 minute, stirring often so that the garlic does not burn. Add the flour and whisk together, cooking for 1 minute. Add the chicken stock and half and half, whisking to combine then add in your spices. Continue whisking until it comes to a low boil and and then stir in the parmesan cheese. Remove from the heat and add in 1/3 of the fried onions, bacon pieces and green beans. Stir to combine and transfer to a buttered baking dish. Top green beans with monterey jack cheese and the remaining fried onion crisps. Bake for 10-15 minutes, remove from the oven and serve while hot.